EMPIRE: Sleeping Bear Dunes National Lakeshore (National Lakeshore) is hosting one of three BARK Ranger events at 10 a.m. on Friday, June 24, at the Platte River Picnic Area adjacent to the Platte River Campground on Lake Michigan Road. Anyone interested in pets in the park, pet safety, or volunteering for the BARK Ranger program is welcome to attend. Pet owners who attend and agree to take the BARK pledge, “Bag their dog’s waste, Always be on a leash, Respect Wildlife, and Know what beaches dogs are permitted on in the park,” will receive a BARK Ranger dog bandanna, a certificate, and other items for their dog. In addition, pet owners can learn how they can become a BARK Ranger volunteer. In its inaugural year at the National Lakeshore, the BARK Ranger program is an effort to educate the public about pet policies to help reduce pet-wildlife conflicts. 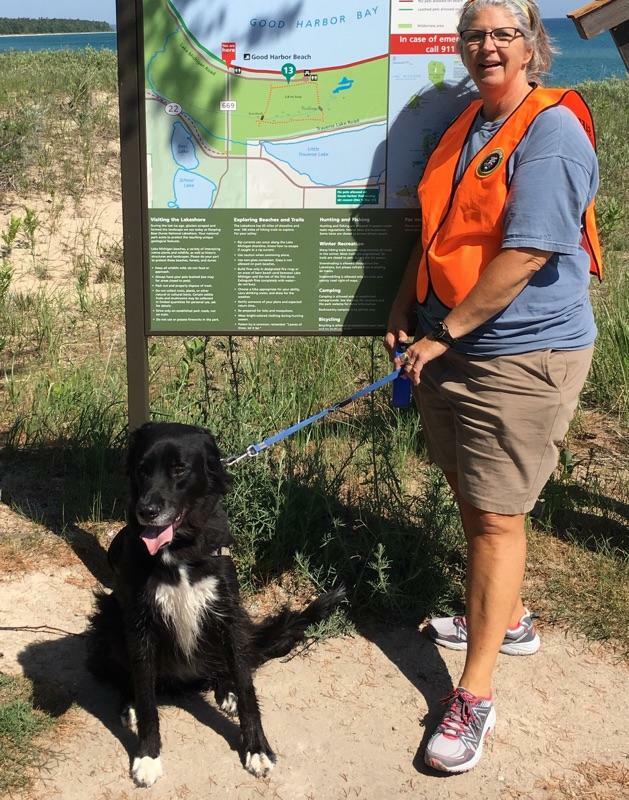 BARK Ranger volunteers and their canine companions serve as ambassadors on National Lakeshore beaches to provide visitors information about the park, pet policies, and pet safety. The event is an opportunity for interested persons to become involved. National Lakeshore wildlife biologist Sue Jennings will present an introduction to the BARK Ranger program and its importance to the piping plover conservation effort. There will also be a talk on pet safety in the summer heat, presented by Dr. Jennifer Sidge, D.V.M., followed by a talk by Mr. Brian Edwards and Piper of the Traverse City Airport K-9 Team. Piper is a wildlife control canine, trained to help prevent catastrophic bird strikes with aircraft. Brian will talk about Piper’s training and his duties at the airport to ensure aircraft safety. Two other BARK pledge events with Piper will be held at 10 a.m. on July 28 and August 17 at the Platte River Picnic Area adjacent to the Platte River Campground on Lake Michigan Road. The National Lakeshore is home to many species of birds, mammals, amphibians, and reptiles. Included in this list is the Great Lakes Piping Plover, a federally endangered nesting shorebird. With more than one-third of the Great Lakes population at the National Lakeshore, following pet policies is crucial to their continued success. In order to create a space where wildlife and pets can coexist, the National Lakeshore requires that dogs be kept on a six-foot leash while in pet-friendly areas. All ranger programs are free with a park pass.